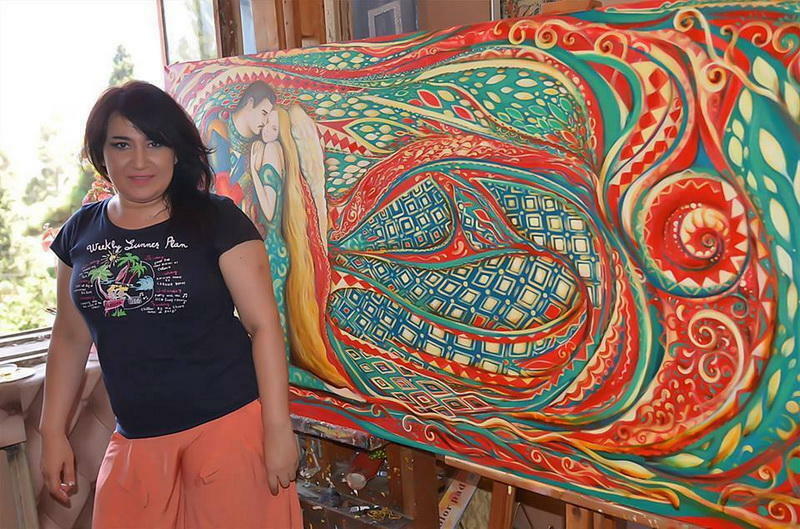 The artwork of Azerbaijani artist Mehriban Efendi will be included in the latest catalogue of the Italian “Byblos” studio. The catalogue’s release is scheduled for June 2016. The head of the studio, Salvatore Constantine, personally sent an invitation to the national artist to invite her to share her works in the upcoming edition. The catalogue will be presented at prestigious museums throughout the world, which are included in National Geographic’s top ten. Moreover, significant museums like the Metropolitan, the Smithsonian Institution in the U.S., the Louvre, Hermitage and others will also put her works on display. Efendi informed local media that the "Particula Coimbra" and "Multimedia Poros" museums located in the Portuguese city of Coimbra will host a surrealist exhibition. The event, organized by the state organization "Condeixa Municipio" will involve 64 artists from 30 countries, and Efendi’s works will also be featured at the exhibition. The exhibition will be held as part of the "Surrealism Now" project by the "Bissaya Barreto" foundation, which has been ongoing since 2010. Meanwhile, Efendi’s most famous picture – “Impression” – is being featuring at the newly opened “Coop Art Gallery” in Slovakia. Mehriban is the winner of the prestigious Sandro Botticelli (named after the Italian painter of the Early Renaissance) award called “For art and talent” in 2014. Her first solo exhibition was held in the United States in 2005. Then she participated in an exhibition titled "Art and Awareness" in Montana; a few of her works were further displayed on large electronic billboards in the "Art Takes Times Square" exhibition in Time Square, New York. Her work, "Harmony," was presented at this exhibition and was published in the book "Art Takes Time Square." It was recognized as one of the best paintings throughout the world in 2012. Efendi took part in an international exhibition organized by Australian artist Paris Saint-Martin, becoming one of the top ten computer artists of 2003. The artist's piece was presented at an international exhibition in the Netherlands in 2009. Efendi was selected as one of the 56 best surrealist painters in the world in 2010. Since 2010, the outstanding artist has participated in the “International Surrealism Today” project, which joins the artists from Europe, Asia, North and South America. She also put her works on display at the Art of the World gallery in Muskegon city in the U.S. and the artist received an invitation for a long-term collaboration with the gallery.